Some of our dinner guests are dismayed by Alexa’s habit of making soup for — gasp — dinner. However! Soup is delicious. Alexa is still most tickled by the immersion blender she received for Christmas. Additionally, it is important to squeeze in as much soup as possible while it is still somewhat cool out. So, black bean soup was on the menu last Wednesday. Alexa loves Mark Bittman’s recipe for smoky black bean soup in How to Cook Everything but she is too diminutive to reach the cookbook shelf with any ease so she approximated. We suggest started by chopping the onion, pouring some olive oil into large pot, sautéing the onion in the aforementioned large pot until soft and sweet. One then adds the chili powder, however much one thinks is appropriate. Cook for a little more. Then add beans, stock, chipotle pepper — raise heat to high, bring to a boil, lower heat and simmer for ten ish minutes. I like putting in less stock and maybe adding more at the end as I prefer a thicker soup. Oh. Then blend it. You can do it in batches in a regular blender, and you can certainly leave some of the beans unblended. But past experience indicates that blendering soup can be dangerous. Oh – then squeeze in lime, to taste. We like to garnish with cilantro, sour cream and maybe some shredded cheese. Because this was a light dinner, we also made sweet potato fries. We love sweet potato fries. We peel the potatoes, chop them into fry like shapes, put them in a bowl with some olive oil, salt, pepper. This time we also added some asiago cheese to bowl the fries and then baked them at 425 F for about 15-18 minutes on a side. There has been much discussion on how to get fries crispy. This time, we tried heating up the pan in the oven before hand and putting them on a hot tray. It sort of worked. Any other suggestions? 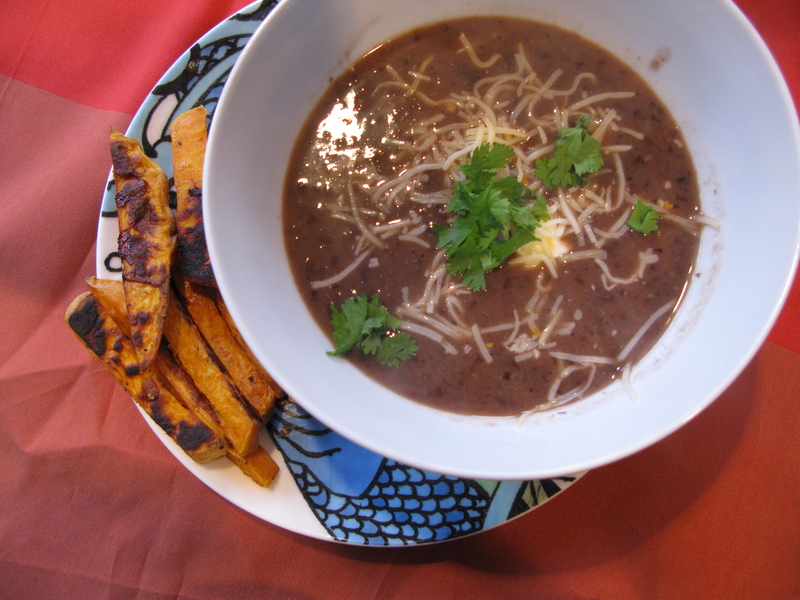 This entry was posted in Uncategorized and tagged black bean, black bean soup, cooking, dinner, family, recipes, soup, sweet potato fries. Bookmark the permalink. Beautiful soup photo, sounds yummy! I put sweet potato fries under the broiler for a couple of minutes after baking to crisp them up, I also leave the skin on. Looking forward to the next entry! Let me know when you begin taking reservations!